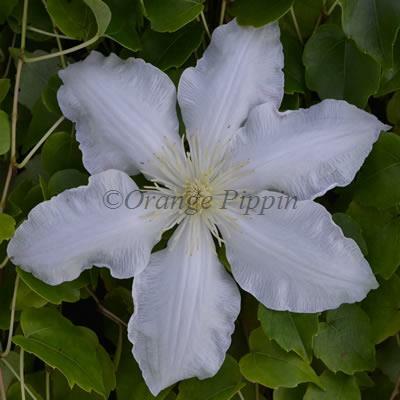 The large, white, wavy edged petals with a lilac tinge and golden centres make Clematis 'Gillian Blades' the absolutely beautiful variety she is. Elegant star-shaped flowers are produced from May to June and again in September. This non-evergreen climber can be adored growing up a trellis, pergola, along a fence or wall, or planted in a container supported on an obelisk on the patio. Clematis 'Gillian Blades' was raised by Jim Fisk of Fisk's Clematis Nursery, Suffolk, England and named after one of his secretaries.